Starsem is the Soyuz company, dedicated to providing commercial launch services with the reliable and proven Soyuz family of launch vehicles. 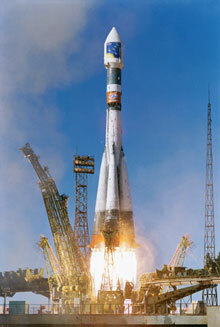 The European-Russian organization brings together all key players involved in the production and operation of Soyuz and is responsible for international sales of the world's most versatile launch vehicle. Created in 1996, Starsem offers the Soyuz for a broad range of mission needs, including satellite telecommunications systems, scientific spacecraft, and Earth observation / meteorological platforms. Starsem provides each customer a true turnkey service, from manufacture of the launch vehicle to mission preparations at the Baikonur Cosmodrome and successful in-orbit delivery of payloads. - Quality assurance and safety activities. Starsem provides the customer with a single point of contact (the mission manager) for all launch service activities in order to simplify and streamline the process.